Washing machine is an important part of a family. Because fast cleaning action depends on routine activities. The people who cannot afford monetarily, purchase a second hand washing machine from present owners or through different online shops who offer a lucrative price. There are certain precautions while purchasing a second hand washing machine so that your deal be economically viable. At first, examine the history of its operation and spin the drum manually. Look, there should be no unusual noise. It must not rock back and forth. To check washing cycle, spinning and rinsing, turn on the old machine and ensure completion. You should check wash cycle timer and it should be ok. Any leakage of water from body, door or water tube are not granted. Must check water seal off connections. No rust inside the drum is well otherwise clothes may catch it. Of course, there are faulty models of good brands are available. So, check the model reliability. You should choose cold fill models. Because they are cheap and also good for the environment. There is a very much important factor in purchasing of second hand washing machines is that it should meet the family purpose. You have to consider load size for the family, types of cycles, spin speeds, suitability to available space and affordability while purchasing a washing machine. You need to check the workability of knobs, switches, lights, and buttons. You should go for those machines which have efficient features like time savers, wash cycles etc. Buy the machine from a trusted online shop or a ppliance store. It will be better if you try to buy from a person whom you know and from solo owners. Also, try to know the reasons for the sale, this will help you to know the condition of the machine. Online shops are the best source to purchase a used washing machine. 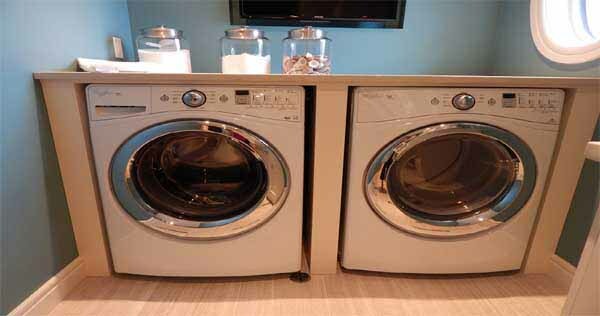 There are a large number of websites who facilitates used washer owner to have deals. The machine can be purchased at an affordable price through negotiation. Generally, washing machines are warranted for three years. Maintenance becomes costly after this warranty. As it grows old, almost of its parts may wear out and gives poor efficiency in operation. It causes in more energy bills. As a result, it will be risky to buy an old machine. However, a new machine may under breakdown very quickly after purchase. Because of use of poor quality materials in manufacturing time to reduce initial cost. So, there is always a risk as it may not give you proper service. So, you should consider options, a new one and used one when you decide to purchase or replace the existing washing machine. If you research deeply considering their performance, efficiency, warranty and economy, you will find new washing machine is more viable economically as compared to used one. Sometimes your budget may not allow you to purchase a new washing machine. But in the long run, a new machine is always worth preference.